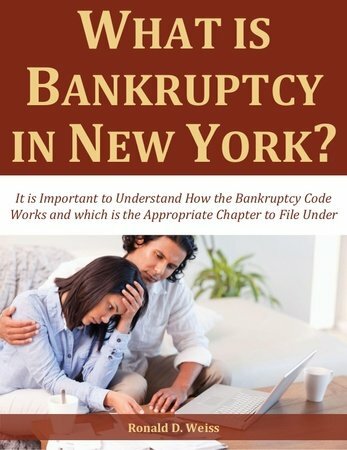 Connect with nybankruptcy for Projects, Phone Consults and Jobs. 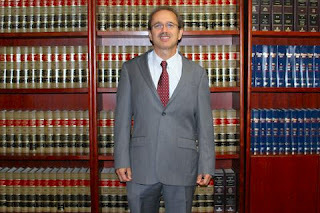 Law Office of Ronald D. Weiss, P.C. 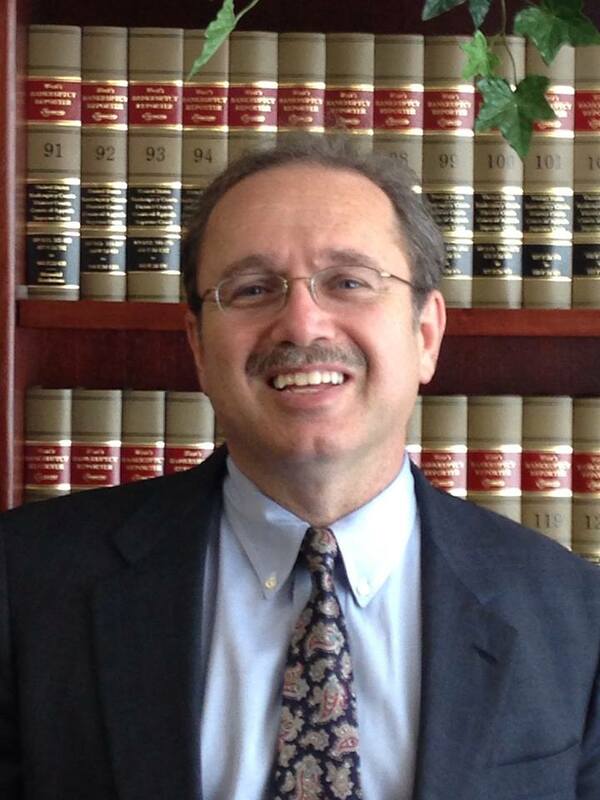 The Law Office of Ronald D. Weiss, P.C. 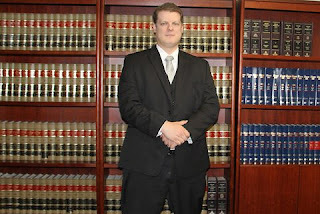 is a bankruptcy, foreclosure, and modification law firm located in Long Island, New York and serving clients throughout Suffolk and Nassau Counties. Ronald D. Weiss, ESQ. is a Long Island bankruptcy, foreclosure, and modification lawyer, who since 1988 has represented individuals and businesses in the greater Long Island and New York areas undergoing financial hardship. 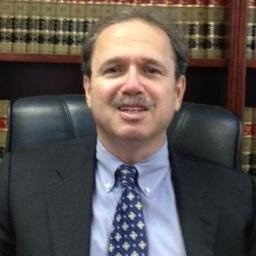 The Law Office of Ronald D. Weiss, P.C., for over twenty-five (25) years, has concentrated in legally representing residents of Suffolk County and Nassau County, Long Island under Chapters 7, 11 and 13 of the Bankruptcy Code, foreclosure defense litigation, mortgage loan modification, and general debt negotiation. 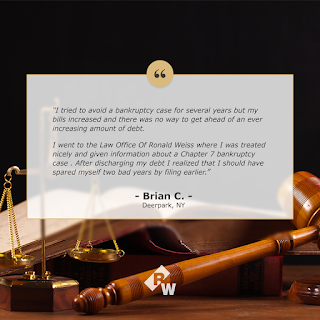 Through advice and representation, our attorneys help determine and implement the best and most affordable ways to: eliminate overwhelming credit card obligations, reduce burdensome mortgage payments, stop creditor collection actions, and overcome foreclosure difficulties. 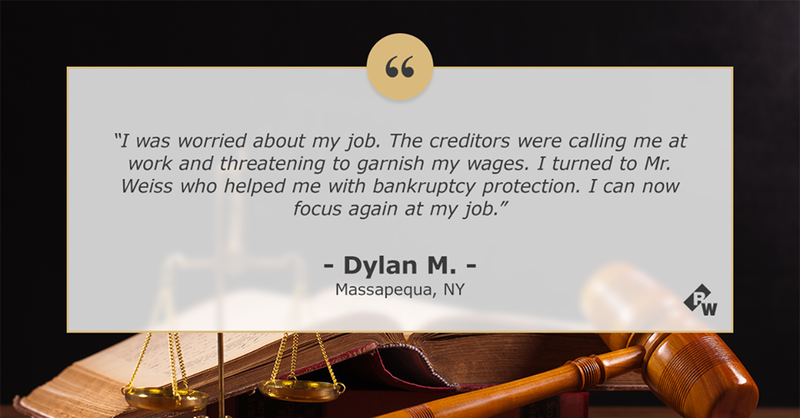 Immediate protection by a Long Island bankruptcy attorney to stop collection actions, creditor harassment, foreclosure actions, wage garnishment, and bank restraint. Chapter 7 bankruptcy, as practiced by our Long Island law firm, eliminates most unsecured debts, such as credit card debts, personal loans, and medical bills, to allow individuals a fresh financial start. 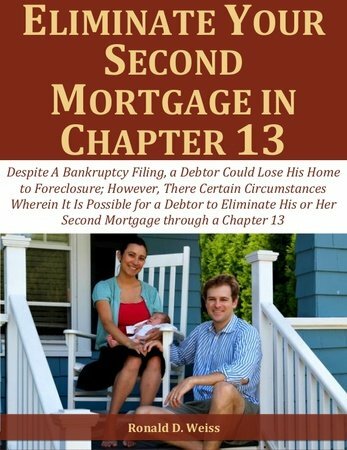 Chapter 13 bankruptcy, as implemented by our Long Island lawyers, helps individuals by curing mortgage arrears and reducing unsecured debt over a 5-year plan, while Chapter 11, as carried out by our LI law office, reorganizes businesses by protecting them from their creditors while a plan is worked on to save the business. Bankruptcy issues include: income means testing, exemption applicability to protect assets, potential avoidable transfers, the discharge of particular debts and the feasibility of potential reorganizations. 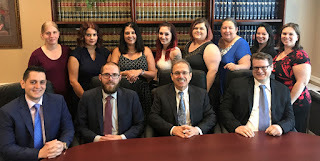 Our law firm concentrates in bankruptcy solutions and is experienced in representing individuals and businesses in Suffolk County, Nassau County and the greater LI and NYC areas in all chapters of the bankruptcy code. Vigorous defense of foreclosure actions by a Long Island foreclosure lawyer with customized, case-specific answers, discovery, conferences, and motions to protect our clients’ homes. Timely defense is important to avoid default and protect a homeowner’s rights. Emergency orders to show cause and motion practice can stop foreclosure sales, and potentially dismiss foreclosure actions, based on defects with documentation, standing, jurisdiction, and other defenses including predatory lending, fraud and misrepresentation. Foreclosure defense by our attorneys gains time and leverage for Suffolk and Nassau County homeowners seeking modifications and other mortgage solutions. 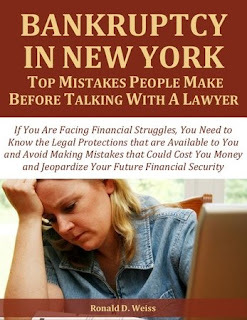 Our law firm concentrates in foreclosure solutions and other debt oriented defense litigation and is experienced in defending individuals and businesses in the greater LI and NYC areas in all aspects of the foreclosure litigation process. Persistent negotiation by a Long Island modification lawyer to obtain more affordable mortgage terms, resolve mortgage arrears, and prevent foreclosure, through mortgage modification or other agreements, including settlements, forbearances and short sales. 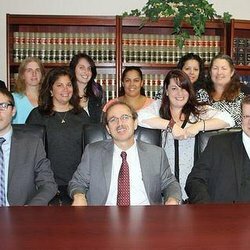 While modifications and other negotiated resolutions are consensual, and while many lenders make these negotiations overly burdensome, our modification attorneys, based on our experience, approach and reputation, have obtained helpful modifications for a high percentage of our Long Island clients. 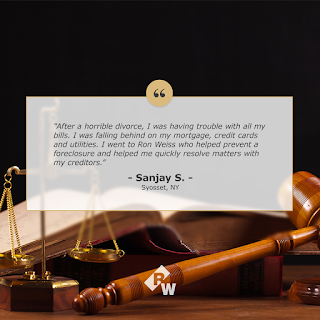 Our law firm concentrates in negotiation solutions, including mortgage loan modification, credit card debt negotiations, and tax debt negotiations. We resolve and settle all manners of mortgage and other problematic debt affecting individuals and businesses in Suffolk County, Nassau County and the greater LI and NYC areas. 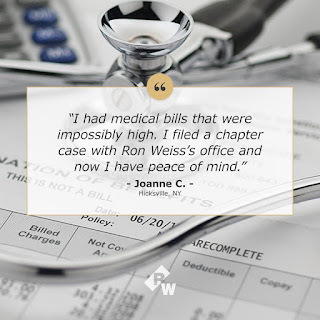 The Law Office of Ronald D. Weiss, P.C. analyzes each client’s case individually, based on the case’s specific facts and the needs of the client. Our goal is to give our clients highly effective representation that is at the same time compassionate and affordable. Often we look at using the above referenced debt solution tools as potential alternatives or as part of a larger approach where they are used to reinforce and build on each other. In each client’s situation we look at and consider all options, their implementation, probable results, timing, and methodology. We develop with our clients a plan in order to best maximize the chances of successfully resolving burdensome debt and strategize to effectively overcome our clients’ economic challenges.